I've been meaning to put more pics of this one up. I want to do another shoot because I fixed up a lot of stuff, like i completely redid the armguard which looks ten times better cuz i used an industrial machine. I plan on redoing the gloves and shoulder guard. But enjoy pics from my first session with it for now. XD i'll try to get more updated ones later. Wow! This is very well done!! i'm a good platinum blonde, no? 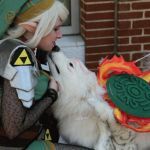 Oh I remember you from the Zelda shoot at Otakon as well as your Terra from Colossalcon. (I was Ordon Village Link). Love the photo. Its really nice. Yesssssss! Thank you! I barely missed the zelda shoot. wish i got there sooner! I had too many costume changes that day! O man, when i was at colossal, i was like a zombie because i had no sleep and no food that day. I was a zombie prettty much at Colossal as well. lol. Those shoes hurt me. I know. Just to make the costume perfect, you have to get the right shoes. Out of interest, where did you get the ears for this?